Discoloured tooth, missing teeth with small peg lateral tooth. She went to another dentist and wanted more cosmetic experience. Wanted whitest shade possible and larger teeth. Successful entrepreneur. 1st visit: Records were taken, including photos and impressions. Direct mock-up was done. 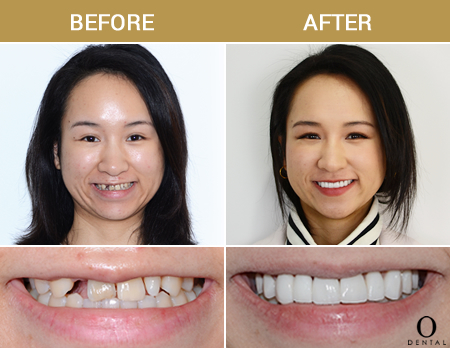 Irina was so thrilled with her new smile, and is featured in the biannual Vogue Cosmetic edition 2018 with Dr Caroline Oh.